This recipe was inspired by a meal at one of our very favorite places: the Boonville Hotel, in the tiny town of Boonville up in the Anderson Valley. The valley has a quite a few vineyards, including Roederer Estate, which makes a very tasty and reasonably priced California sparkler, and Toulouse vineyards, where we tasted some very nice Pinot Noir). We love going there because it's far less crowded and pretentious than certain other wine producing valleys; tastings are generally free or $5 at most, and on several occasions we've been in a tasting room with just us and the winemaker. There is also the Anderson Valley Brewing Company, which not only makes some very nice beer, but also has a frisbee golf course and an interesting brewery tour. We also like taking a walk through the old growth redwood groves at Hendy Woods State Park (which, sadly, is one of the 70 parks slated for closure due to budget issues), and stopping by the Philo apple farm for some fresh apple juice. The hotel is one of the few buildings on the main strip in Boonville. There are only ten rooms, so going there usually takes some advance planning (especially since the New York Times discovered our secret). The rooms are clean, quiet, brightly colored, and have no televisions or alarm clocks. The restaurant serves a family style meal, prix fixe, and the menu is whatever they are serving that night (in order words, you don't have a choice, but that has never been a problem for us). Though the inside of the hotel and restaurant is very pretty, and decorated with wildflowers, the big patio is one of the best parts of the dining experience. You can sit and eat under a big crabapple tree, and will probably get a visit from a big mellow cat named Gus. You're surrounded by tan, grassy hills specked with big oak trees and vineyards, and if you go in the summer the nights are warm and pleasant. But oh, I haven't even gotten to the food yet, and that was the point, wasn't it? Every meal there we have had has been excellent, and they often surprise us with new ideas that we take home and incorporate into our cooking. One of these was the very simple concept of putting breadcrumbs on a salad. It was fantastic! 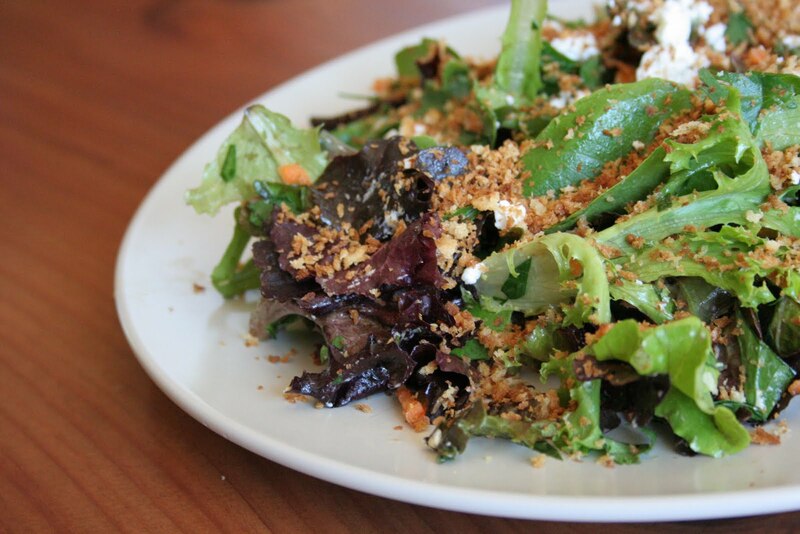 It's like croutons, but better, because the breadcrumbs coat the salad and fill every bite with crunchiness. You don't have to try to stab a crouton and distribute them among your bites. 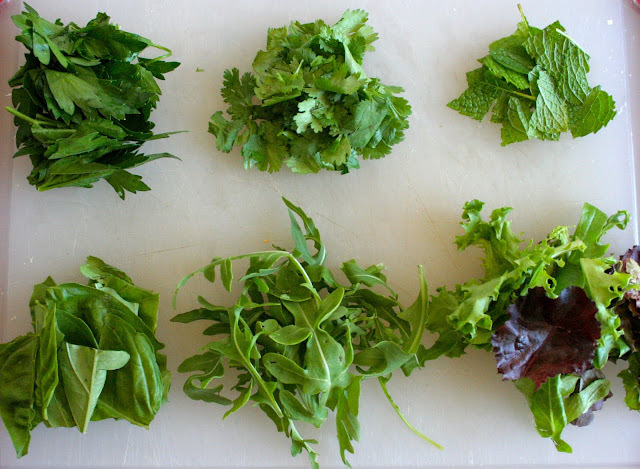 We were also surprised and delighted with the idea of putting mint in a salad. 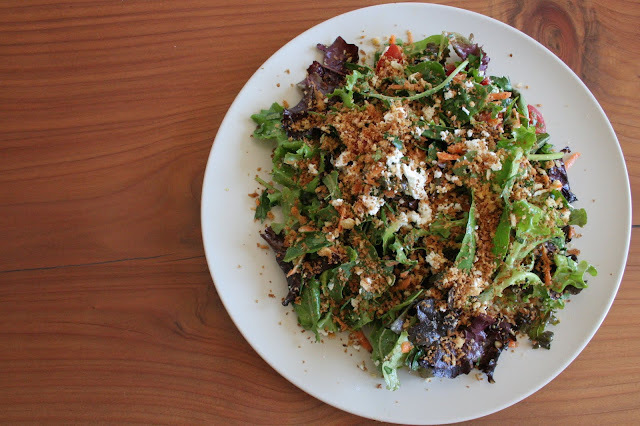 So we went home and created this Boonville-inspired herb salad with garlic breadcrumbs - the recipe here is just a loose formula which can readily be adapted to your tastes, with your preferred dressing and salad ingredients. 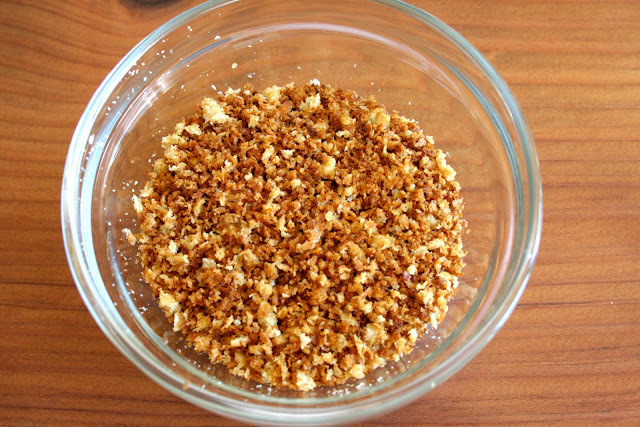 The main thing we wanted to tell you was - make breadcrumbs! Put them on your salad! Eat them! You will be happy, we promise. 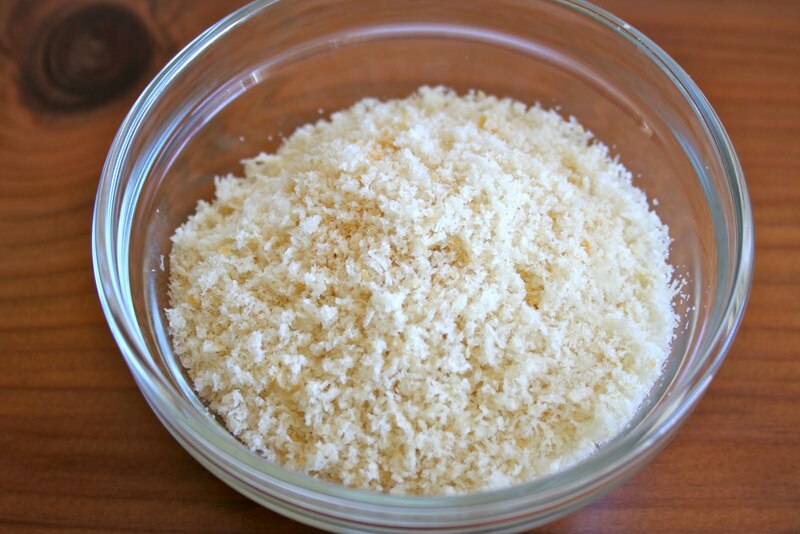 Tear the bread into large chunks and put it in a food processor or spice grinder. Grind until you have breadcrumbs. Heat the oil over medium high heat. Remove the skin from the garlic clove, then crush the clove with the side of a knife. Put the garlic into the oil and let it cook for about 3 minutes, then remove and discard (this allows you to impart garlic flavor to the oil and thus the breadcrumbs without having the garlic burn). Put the breadcrumbs in the pan with the still hot oil and cook, shaking and stirring frequently, until they are golden brown and crisp. They will keep in an airtight container for a couple of days (we've found that 1 slice of bread gives us enough breadcrumbs for four salads). Put all ingredients in a small bowl and whisk together. Coarsely chop the herbs, then toss all ingredients except breadcrumbs in a large bowl. Mix well, plate, and top with the breadcrumbs.